Salomon Rondon is challenged by Tottenham Hotspur's Davinson Sanchez. When the phone call finally came, there was no hesitation from Salomon Rondon. The striker knew he was Rafa Benitez’s top transfer target – and had been throughout the summer – as the Spaniard sought a new attacking option. Rondon replaced Joselu on Saturday. 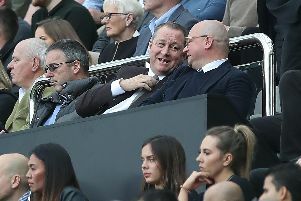 But a protracted transfer saga, which relied heavily upon Dwight Gayle moving in the opposite direction, threatened to scupper any deal. Eventually, as the transfer window ticked into its final days, there was a breakthrough. And such news came as a delight to Rondon, who was eager to head up to Tyneside as soon as possible. “I was in Birmingham with my family, and my agents told me,” said the striker, speaking to Newcastle’s match day programme. “It’s a great opportunity for me, for my family, and he talked to them before we came here. Benitez made no secret of his desire to land the Venezuelan having courted Rondon – initially on a permanent basis – all summer. Such interest from the manager gave Rondon confidence that the move was for him, and now he is ready to kick-on and help the Spaniard achieve his goals in the Premier League. “It’s a big decision, but when you know about the interest of the gaffer; the most [important] thing for the player is that,” he admitted. Benitez resisted the temptation to start with Rondon from the off against Tottenham in Newcastle’s season opener, with the striker having only trained with his new teammates on a couple of occasions. But when the former West Brom man was introduced from the bench with half an hour to play, he immediately caught the eye. His pace and power immediately lifted St James’s Park with the fans quick to vocalise their appreciation for his efforts in what was a lively debut performance. Such a reaction will have been no surprise to Rondon, who was already well aware of the ‘amazing’ atmosphere generated by Newcastle fans. “I’ve played a few times when I’ve come to St James’s Park,” he added. Upon signing, Rondon took the No 9 shirt – one which generally sees the holder enjoy a special relationship with Newcastle supporters. And the early evidence suggets that such a connection is already starting to form. Fans were quick to express their delight at the striker’s signature, while a Rondon-inspired remake of George Ezra’s chart hit ‘Shotgun’ proved an internet hit. Such a shirt number could come with added pressure, but Newcastle’s latest number nine is keen to transform pressure into motivation. “I am behind big people who wore this number, and I am motivated, to be honest,” he said. “I want to score goals. I know the history behind this number but I don’t feel pressure – I feel motivated. “To take the No 9is a pleasure for me. “I know this number is heavy in this club. A lot of top strikers have played here, like Alan Shearer and Tino Asprilla, so it’s important for me as a striker.